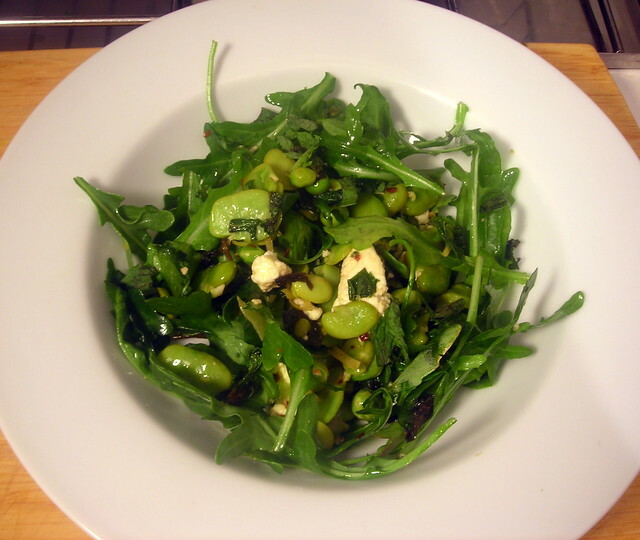 Fava beans are a hallmark of spring and summer. Bright green, sweet and tender beans form inside five- to seven-inch long pale green, slightly hairy pods, about three to half a dozen per pod. The beans are eaten while still young and tender, enabling harvesting to begin as early as the middle of spring for plants started under glass or over-wintered in a protected location, but even the main crop sown in early spring will be ready from mid to late summer. Any beans that are left to mature fully, are usually harvested in the late autumn. The young leaves of the plant can also be eaten either raw or cooked like spinach. Favas in the early spring can be used in much the same way as peas — in a vegetable ragoût, in a soup or risotto. As the season progresses, the beans become more mature and thus require lengthier cooking times. Cook favas in lightly salted simmering water until tender, then mash into a paste and season with garlic, herbs and lashings of excellent olive oil. Serve as crostini, in filled pasta or with grilled fish. Shell the fava beans and discard the pods. Bring a pot of water to a boil, add the fava beans and peas and simmer for 1 to 2 minutes. Drain, then shock the vegetables immediately in a bowl of ice water. Drain the bowl, then remove the outer skin of each fava bean. Discard the bean skins. When you’re done, you should end up with a bowl of peeled fava beans and cooked peas. Gently warm olive oil in a large skillet over medium heat. Add fava beans, peas, lemon zest, lemon juice and dried red pepper flakes to the pan. Cook until the fava beans and peas have been warmed through, about 2 minutes, stirring occasionally. You don’t want the vegetables to brown or lose too much of their green color; if it progresses to that point, they’re over-cooked. Stir in the ricotta cheese and chopped mint; mix well. Taste for salt. Remove the pan from heat. Place the arugula leaves in a large salad bowl. Fold in the fava bean mixture. Toss a few times; the arugula should be just barely dressed with the lemony-peppery dressing. Spoon salad onto individual plates or shallow salad bowls, scatter additional mint leaves on top and serve at once. Time: About 40 minutes. The vast majority of time will be spent peeling the fava beans. This is my contribution for Souper (Soup, Salad and Sammie) Sundays for the week of July 2, 2012 to July 8, 2012, a weekly foodblogging event organized and hosted by Deb of Kahakai Kitchen. 26 Jun	This entry was published on June 26, 2012 at 2:53 pm. It’s filed under cooking, food, food photography, Italian food, recipe, Souper (Soup, Salad & Sammie ) Sundays, spring, summer, vegetarian and tagged dinner, fava beans, food photography, gluten-free, Italian food, peas, salad, spring, summer, vegetarian. Bookmark the permalink. Follow any comments here with the RSS feed for this post. So green and delicious looking–perfect for the season. 😉 Thanks for sharing it with Souper Sundays this week.